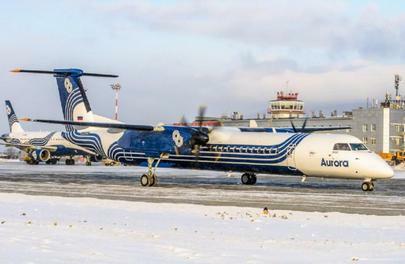 Aurora Airlines, which operates in Russia’s Far Eastern region (51% owned by Aeroflot, 49% by administration of Sakhalin region), is gearing up to operate the first commercial flight on board a Bombardier Q400 aircraft this week. The 70-seat Bombardier Q400 (tail number RA-67254), which joined the carrier’s fleet on December 31 last year, will carry passengers from Yuzhno-Sakhalinsk, the administrative center of Sakhalin region, to Mendeleyevo Airport on Kunashir Island, an industry source told Russian Aviation Insider. The flight distance is approximately 400 km. Earlier, Aurora’s management announced that the Q400 will be used on other routes within the region as well. The carrier expects delivery of two more Q400s in March. Aurora’s engineering and maintenance department has received clearance from the Russian aviation authorities to provide periodic and line maintenance on the type up to and including A-checks. Aurora is the Canadian aircraft’s second Russian operator after Yakutia Airlines, which operated its first flight on a Q400 from Yakutsk three years ago. At the end of 2015, Aurora carried 1.125 million passengers, 7.1% more than in the previous year. The airline holds 16th place among Russian carriers. Besides the Q400, Aurora operates a 21-aircraft-strong fleet made of nine Airbus A319s, three Boeing 737s, seven Dash 8-200/300/400Qs and two DHC-6 Twin Otter Series 400.